"Ever since I bought the Grom about a year ago, I have completely fallen in love with it," Rogers told me. "I bought it exclusively for city riding since my other motorcycle prefers the highway. 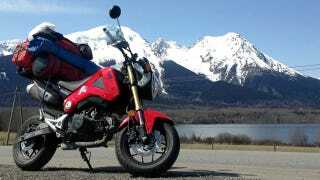 But before long, I found myself further and further from home on the Grom, taking it on all day adventures into the mountains or out to the coast." Rogers had planned the trip to Alaska for a while, and when the time came, there was something sadistically compelling about taking the 125cc Honda on the trip. "It was something new and exciting and a welcome change from blasting down the highway on a motorcycle with an engine over 10 times the size of the Grom's," he says. "Don't get me wrong, I love big engines and going fast, but the Grom offers a unique riding experience." That unique experience wasn't without its challenges. A trip that long, with that many climate and elevations changes would be tough on a dual-sport, but on a glorified pocket bike? It's lunacy. "The biggest challenge was keeping my focus during the last part of the day," Rogers says. "After 10 hours of riding I was tired, both physically and mentally. On the Grom it was more physical than I had previously experienced. The distraction of thinking about getting to camp or a comfortable hotel room was enough to cloud my judgement and I had to work hard to overcome that." Aside from the physical, mental, and environmental strain (also bears), there was the obvious issue of gear. It's not like there's a big market for Grom saddlebags, so Rogers grabbed a milk crate and some bungee ties, along with a few bags, and stuffed it all to the gills. He managed cram a tent, sleeping bag, sleeping pad, tarp, butane stove, a pan, a trowel, a spare fuel can, a first aid kit, a small tool kit, a quart of oil, and a few bottles of water on board. That didn't leave much room for anything else, so enter everyone's favorite German tourist accessory. "Since the Grom can't really fit any tank bag I could find I decided on using a fanny pack," Rogers admits. "I know they aren't really 'in' but having my maps, wallet, phone and documents for border crossings in one place made everything so much easier. The pockets on my suit weren't able to hold everything and I don't like riding with a backpack, so this was the next best thing, and now I'm kind of sold on it." And after than many miles, he's still sold on the Grom. When I asked if he'd do it again, he doesn't hesitate.